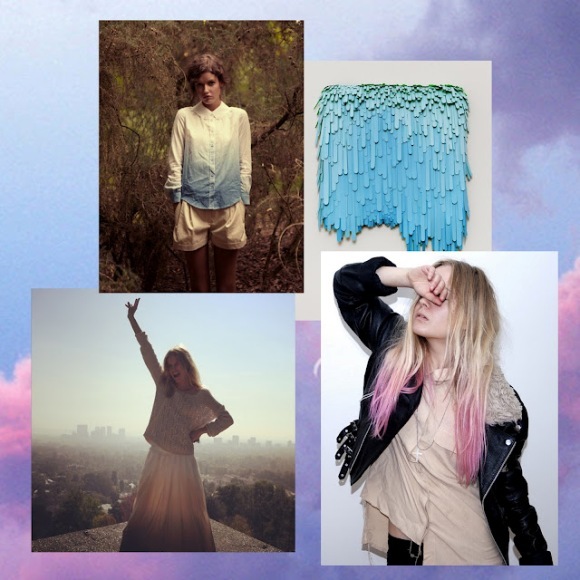 This week we’re sharing some of the blog’s greatest hits! These are some of our most loved posts by you, our amazing readers. 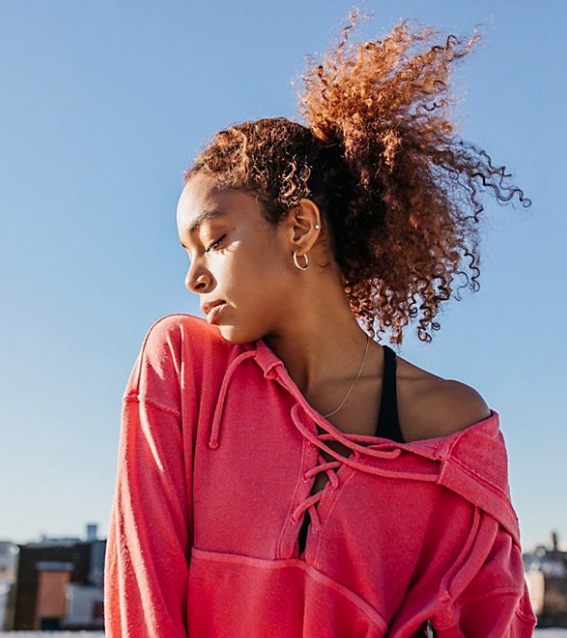 “She drips in color” comes to mind whenever I see this trend — it brings a certain happiness to tees, dresses, shorts, shirts… almost anything! And, it has become an eye opener look for spring and summer. 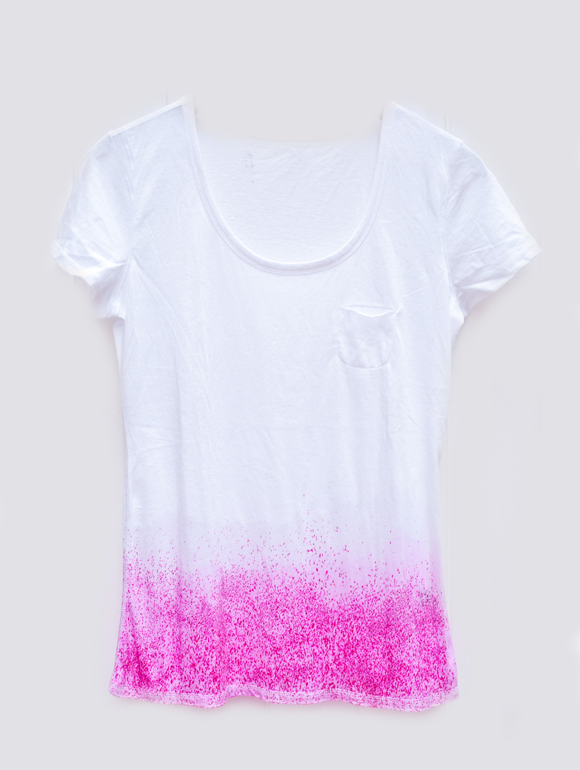 We love how dip dying your basic tee gives it new life in a fun and creative way. There are so many different ways you can experiment with this technique that you can kind of get carried away – here we love the subtle approach with a sprinkled burst of color. 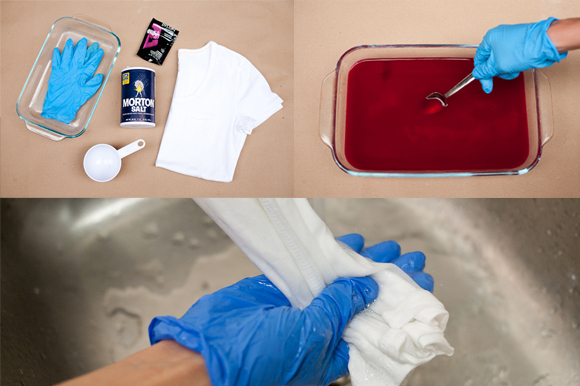 Follow these easy steps to create your very own dip dye tee — you can do it with cotton dresses too!! What you need: A tray, 1 measuring cup, salt, Dylon dye of any color (not the machine washable ones), heavy duty cleaning gloves and a basic white tee. Mix a quarter of the Dylon dying powder into the tray with 4 cups of warm water and 4 tablespoons of salt. Once the powder has dissolved, fill the tray up with water to make a very diluted color. 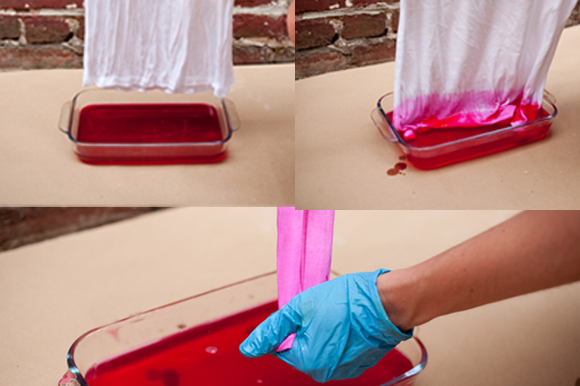 Soak the bottom of the tee so the color will trail up it nicely. Place the tee slowly in the color until you see the color running up. Keep it in there for 1 minute (you want the color to be quite faint), then drain the excess water and rinse in the sink under cold water. Hang to dry for 15 minutes until it’s damp. Take the leftover dye powder and sprinkle onto the tee as much as you like. It creates a lovely speckled effect! Hang to dry. Once it’s fully dried and the dye has absorbed in, give it another rinse in the sink and dry again. 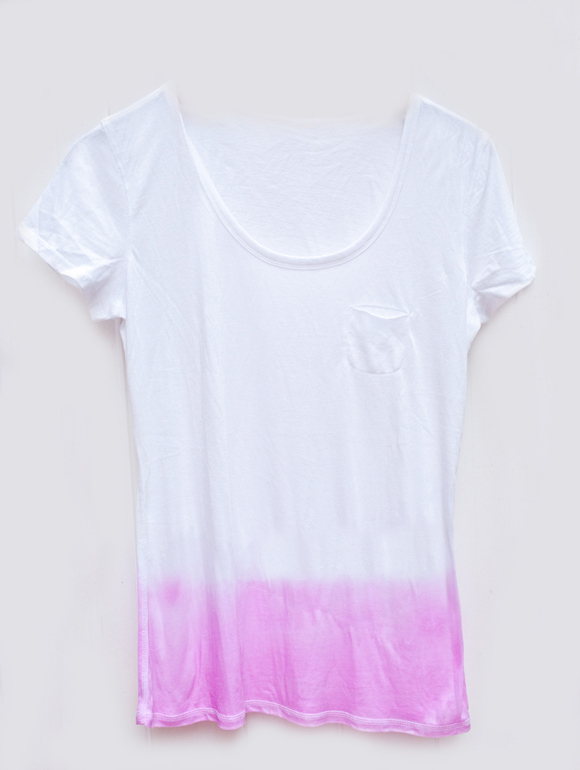 Then you’ll have your very own dip dye tee for the summer! What a beautiful and creative idea! Never have seen a DIY tyedye that was that well done! Thinking I may have to give this one a shot on a lazy summer afternoon :)! Great post! I love this speckled dip dye look! Thank you for posting easy steps to follow. Time to gather up all my old whites and get started! 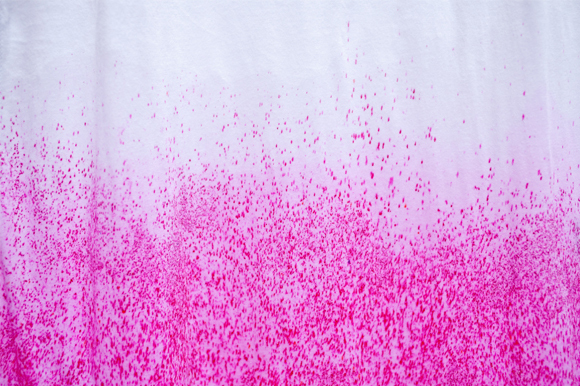 nice idea with the speckling – how would you suggest to wash it? hooooly crap, the speckling is amazing. doing this soon! xo. I’m doing this asap! What a perfect shirt for summer! I love that the instructions are simple. On my bucket list for summer! Hi Lily, I would suggest you hand wash it in cold water! I love the dusting technique…I accidentally did this to the top of my dryer, but never thought to try it on the fabric! Really cute idea! I have to say though, I miss your blogs old layout. It’s a pain to have to click on every single post to look at the whole thing. I miss the days of being able to simple scroll through all the lovely images you post! Can’t wait to try this. So creative and fun! Great job. I love this idea. My daughter is having a baby girl and I am going to do this to some onesie’s. That turned out great! I’ve seen a lot of dip dye tutorials and this is the most creative. Does it work on jeans? So pretty, I love it! I’m going to try this with sheer white curtains for our sliding glass door and kitchen window in sea glass colors for a beach-y vibe. thanks for another inspiring, yet easy idea!